The Movistar Yamaha MotoGP team was disappointed to conclude the final day of preseason testing at the Losail International Circuit in Qatar today without being able to ride due to a sudden rainstorm. 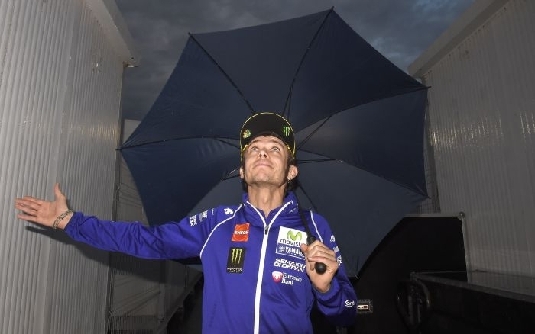 Riders Jorge Lorenzo and Valentino Rossi were looking forward to testing some new settings they found in the previous days, but were unable to do so as the rain caused the wet track to reflect the glaring floodlights, making for unrideable conditions. As there were also no wet weather tyres available the session was red flagged and the teammates had no other option than to wait for the weather to clear up and a dry race line to form on track. When there was still no sign of improvement in the weather conditions after 7pm the team was forced to call it quits. With no track-action being done today by any of the MotoGP riders, Lorenzo and Rossi remain fourth and fifth place respectively in the combined session times. They now look forward to return to the Losail International Circuit on Thursday the 26th of March for the first Grand Prix weekend of the season under the floodlights in Qatar. The Monster Yamaha Tech3 Team riders did not ride in the final day of pre season action due to a sudden downpour in Qatar. It was not possible for any rider to take their bikes out on the track due to the rain which caused a reflection of the lights on the asphalt. With no rain tyres available either, the circuit did not dry in time and hence, no riders opted to run. Despite this, the test was overall positive for Bradley Smith, who concluded the final pre season outing in 8th position with a best time of 1’55.648, that was under two tenths of a second off 4th place. The 23 year old rider made further progress with the setup of his Yamaha YZR-M1 which had an encouraging outcome after undertaking 92 laps around the Losail International circuit. The result leaves Smith fully motivated for a flying start to the MotoGP season at Qatar on the 29th March where he will intend to begin his 2015 campaign with a strong points scoring finish. On the opposite side of the Monster Yamaha Tech3 Team garage, Pol Espargaro finished the test right behind his teammate in ninth position and was split by only one hundredth of a second with a best lap of 1’55.658. This performance signalled a positive close to the pre season testing as he undertook a huge amount of work, whereby he completed 96 laps over two days of running. Although the loss of track time prevented any further improvement, the 2014 MotoGP rookie of the year now confidently looks ahead to the first race of 2015 where he will aim to battle to finish as the leading satellite MotoGP rider. The weather was the real star of the last day of testing at the Losail circuit. The rain began to fall heavily in the morning and it made it impossible for the riders to go on the track. Stefan Bradl and Loris Baz in fact spent the day working in the pits without being able to get on their Forward Yamaha. The newly renewed Athinà Forward Racing ends testing today after sporting for the first time its new livery and aerodynamics. Stefan Bradl was not at his best, first because of an intestinal problems and then because of a serious crash on Sunday. The German failed to complete the planned program, but is confident he can lead the Open pack from the very first race. He posted a best lap of 1.56.724, reaching 21st position in the timesheets. On the other side Loris Baz had two days of intense work instead as he continued his work to adapt to the new bike. The Frenchman completed 80 laps with a personal best of 156.936, 23rd. The three-days Doha test officially closes the winter program for the MotoGP team. The next scheduled event is the first race of the season in a little less than two weeks at the Losail circuit.